Zion National Park is a nature photographers dream! Towering sandstone mountains, deep canyons, slick rock domes and the fall color of Cottonwoods and Maples. This workshop will explore the best that the park have to offer and is for the fit and adventurous photographer. After three days in Zion, we head over to Page, AZ to photograph off-the-beaten path secret locations and iconic desert landscapes. 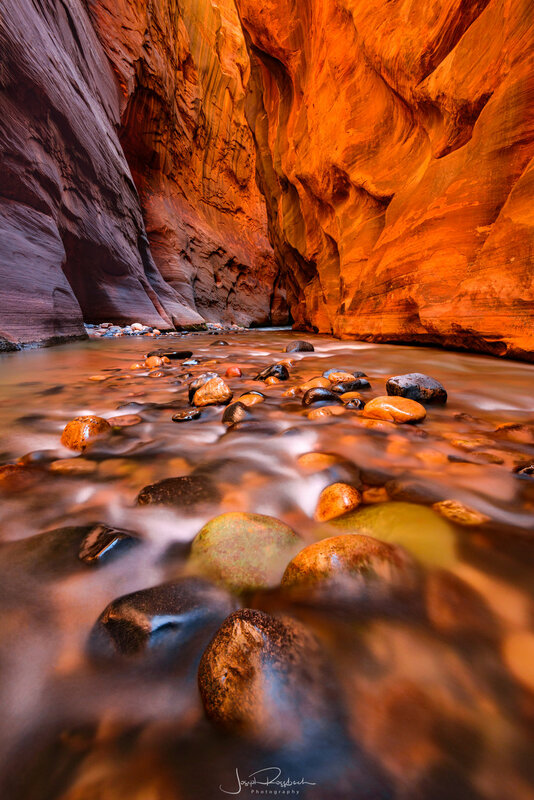 We will be hiking and photographing the world famous Virgin River Narrows! Day 1: 2pm meet and greet followed by an afternoon of photographing Zion Canyon. Day 2: Sunrise to sunset photographing Zion. Day 3: sunrise to sunset photographing Zion. Day 5: Sunrise shoot in the amazing canyon country surrounding Page. Afternoon processing session, afternoon/sunset photoshoot. Workshop ends after sunset. Students are responsible for their own lodging, transportation and meals. A block of rooms has been reserved at the LaQuinta in Springdale, Utah and the Best Western View of Lake Powell in Page, AZ. Please reference Joseph Rossbach Photographic Workshops or Joseph Rossbach Photography when making your reservation. The nearest airport is Las Vegas International Airport (2.5 hour drive from Springdale, UT and a 4 hour drive from Page, AZ at the end of the workshop). There will be some more strenuous hikes including the Narrows that in valve hiking up and wading through the river. The longest hike is 6 miles RT. We will be spending a lot of time outdoors shooting in late autumn conditions. Daytime temperatures in the desert during winter can vary quite widely. It’s imperative that participants be prepared for outdoor winter recreation, lots of warm layers, hats, mittens, good outerwear and warm boots are a must. A modest level of health and fitness will greatly enhance your experience.